The Ministers Council Endowment provides financial support to equip ministerial leaders through providing quality resources that increase effectiveness in their ministries and communities. There are two ways to designate your gifts: to the Ministers Council Endowment or to the Together in Ministry Fund. A small portion goes to offset administrative expenses. The Together in Ministry Program has allowed thousands of clergy and laity to participate in peer group learning as a means to gain greater support, fellowship, learning, and encouragement in ministry. The Lily Endowment provided generous resources to implement this program, but now grant funds have been expended. The desire to continue these valuable peer groups still burns. To enable this program to continue we have established the Together in Ministry Fund. Contact the American Baptist Foundation by email at abfadmin@abc-usa.org or by phone at 610-768-2035. 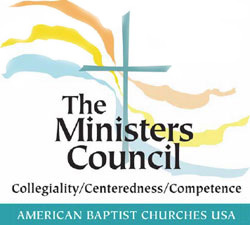 Don't forget to tell them that you desire to help grow the Ministers Council Endowment!